Sweet potatoes, a root vegetable have been described as one of the healthiest foods that nature has endowed man with. This distinctive tuber comes in variety of colours, such that they can have red, orange, yellow or even purple skin. They can also have orange, white or purple flesh, adding to the visual appeal that a food could give. Though sweet potatoes are … well, sweet, experts say they won’t cause blood sugar spikes and crashes — phenomenon that are usually linked with fatigue and weight gain. Nutritionists say when eaten, the natural sugars in sweet potatoes are slowly released into the bloodstream, helping to ensure a balanced and regular source of energy. The vegetable is also regarded as a good source of fibre, which helps with blood sugar regulation and keeping you regular as well. For weight watchers, sweet potatoes can be eaten without the usual fear of packing the pounds around your waistline. This is because this tuber crop has fewer calories per serving than yams, experts assure. Again, sweet potatoes are said to be slightly higher in protein than yams; and the more of it you eat, the better for your health. More importantly, sweet potatoes can help prevent certain cancers, experts say. Indeed, the World Journal of Gastroenterology reported that sweet potato contains a protein that inhibits human colon and rectal cancers. The results were dose-dependent, meaning that the higher the amount of sweet potato protein, the better the cancer-inhibiting effects. Scientists at the Office of Dietary Supplements at the National Institutes of Health, say the body needs Vitamin B6 for more than 100 enzyme reactions involved in metabolism. It is also involved in brain development during pregnancy and infancy as well as immune function. Sweet potatoes contain high levels of vitamin B6, and this helps to reduce the chemical homocysteine in our bodies. Homocysteine has been linked with degenerative diseases, including heart attacks. Sweet potatoes are a good source of Vitamin C, which most people know for its power to ward off cold and flu viruses. Paediatricians say Vitamin C is also essential for bone and tooth formation, digestion, and blood cell formation. The vitamin also contributes to wound healing and produces collagen to keep skin youthful. It even improves our ability to cope with stress and protect our body against toxins that may be linked to cancer. Experts say the body is not able to make Vitamin C on its own, and it does not store vitamin C. It is therefore important to include plenty of vitamin C-containing foods in your daily diet. In addition, these nutritious tubers contain Vitamin D (which is actually a hormone) to support our immune systems and overall health. This vitamin is primarily made in our bodies when we are exposed to adequate sunlight and contributes to healthy bones, heart, nerves, skin teeth and thyroid gland. Eat sweet potato for adequate nourishment. The MedlinePlus Medical Encyclopaedia notes that iron is a mineral that our bodies need for many functions. For example, iron is part of haemoglobin, a protein which carries oxygen from our lungs throughout our bodies. It helps our muscles to store and use oxygen. Iron is also part of many other proteins and enzymes. Your body needs the right amount of iron, experts warn. If you have too little iron, you may develop iron deficiency anaemia. People at higher risk of having too little iron are young children and women who are pregnant or have periods. Warning against taking iron supplements without the supervision of a physician, experts say too much iron can harm. So, meet your iron needs through the iron content in sweet potatoes. They help with energy levels, as well as in the production of red and white blood cells. It also helps us in developing resistance to stress, makes for proper immune functioning, and the metabolising of protein, among other things. The authorities at The George Mateljan Foundation say this essential mineral is required by the body for maintaining normal muscle and nerve function, keeping a healthy immune system, maintaining heart rhythm, and building strong bones. A deficiency in magnesium can lead to muscle spasms, cardiovascular disease, diabetes, high blood pressure, anxiety disorders, migraines, osteoporosis, and cerebral infarction. Conversely, consuming too much magnesium typically causes diarrhoea as the body attempts to excrete the excess. Sweet potatoes are a good source of magnesium. Not only is magnesium considered the relaxation and anti-stress mineral, it is also critical for healthy artery, blood, bone, heart, muscle, and nerve function. Doctors L. Bellows and R. Moore, two researchers at Colorado State University, say potassium is an important electrolyte that’s crucial for life. “It’s necessary for the heart, kidneys, and other organs to work normally. Primarily, potassium functions to regulate water and mineral balance throughout the body,” they explain. Scientists say potassium works with sodium to maintain the body’s normal blood pressure; while research suggests that increasing dietary potassium may provide a protective effect against hypertension (high blood pressure) by increasing the amount of sodium excreted from the body. A high potassium intake has also been linked to a reduced risk of death due to cardiovascular disease. 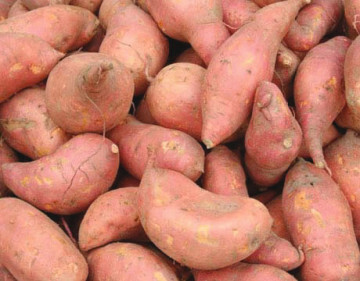 Nutritionists say the rich orange colour of many sweet potatoes is a visual indication of the high levels of carotenoids that occur in these tubers. Carotenoids help strengthen our eyesight and boost our immunity to disease; they are powerful antioxidants that help ward off cancer and protect against the effects of ageing. “Studies at Harvard University of more than 124,000 people showed a 32 per cent reduction in risk of lung cancer in people who consumed a variety of carotenoid-rich foods as part of their regular diet,” experts enthuse. Another study of women who had completed treatment for early stage breast cancer conducted by researchers at Women’s Healthy Eating and Living found that women with the highest blood concentrations of carotenoids had the least likelihood of cancer recurrence. “Moreover, the carotenoid beta carotene is the precursor to Vitamin A in your body,” scientists say. Vitamin A is a fat-soluble vitamin that supports healthy eyes and skin. Beta carotene has also been studied for its ability to guard against different types of cancer. Recently, researchers discovered a related group of nutrients in sweet potato called batatosides that have been found to have antibacterial and antifungal properties. New research shows that cyanidins and peonidins found in sweet potatoes may be able to reduce the potential health risk posed by heavy metals.